My favourite thing about being in New York for so long was that I finally had a chance to meet up with a bunch of other bloggers throughout my stay. It’s so lovely to be able to visit somewhere you don’t really know and already have a bunch of friends who also can recommend stellar places to eat! In the time I was there I managed to nab two whole days hanging out with Kamran who blogs over at The Sophisticated Gourmet. He’s got an insatiable sweet tooth just like me so made sure we went to a restaurant which a) serves pancakes at lunch time and b) gives you a massive bottle of house-made syrup along with them. Acting as my Trader Joe’s guru he pointed out the massive, cheap chocolate bars (500g for like $5, what the heck!? People that’s GOLDEN INFO omg) and cookie butter. We decided that on a separate occasion we should bake together. A few whatsapp messages later and we’d decided on a berry laced pudding cake. Cut to the next night when I informed him that the toaster oven was tripping the circuit breaker any time I baked and we were back to square one. 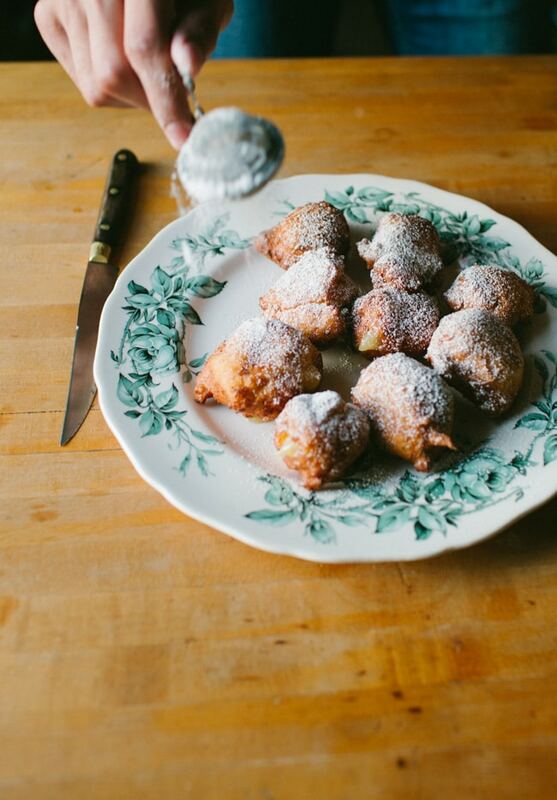 Ideas of pancakes or no-bake pies were tossed around but we finally settled on these luscious little ricotta fritters. I have to say I’ve never been happier to not have an oven! 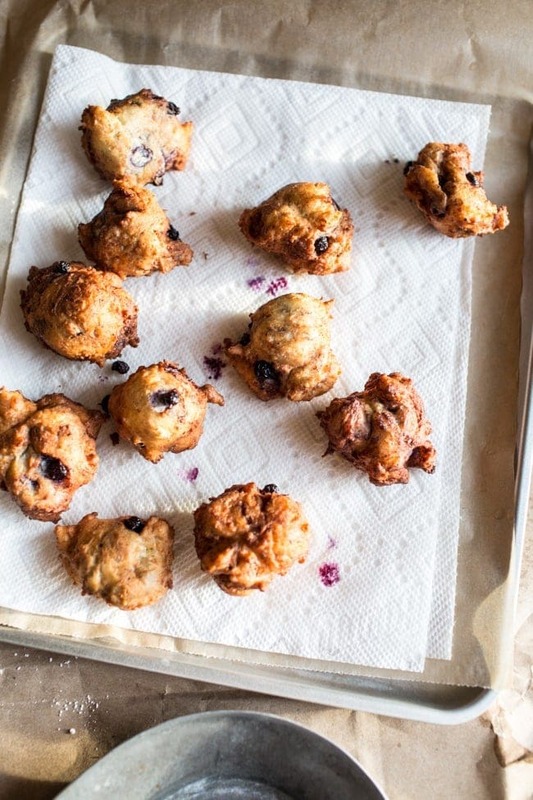 The batter for these babies comes together in about 5 minutes with just a spoon and a bowl, basically. Couple that with the fact that they don’t require rising time means that they’re super speedy to make. 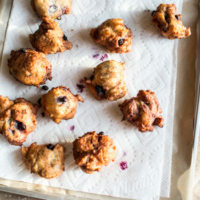 I went for a pairing of wild blueberries and coconut in the batter with a simple glaze. Those juicy bursts of blueberry definitely brought the doughnuts to the next level (and the fact I’ve never seen wild blueberries available in the UK makes me super sad now!). Kam went for lemon flavoured batter with a lemon curd filling plus a super simple raspberry dipping sauce. I don’t think we’re ashamed to say that we ended up eating nearly ALL of them by the end of the day. 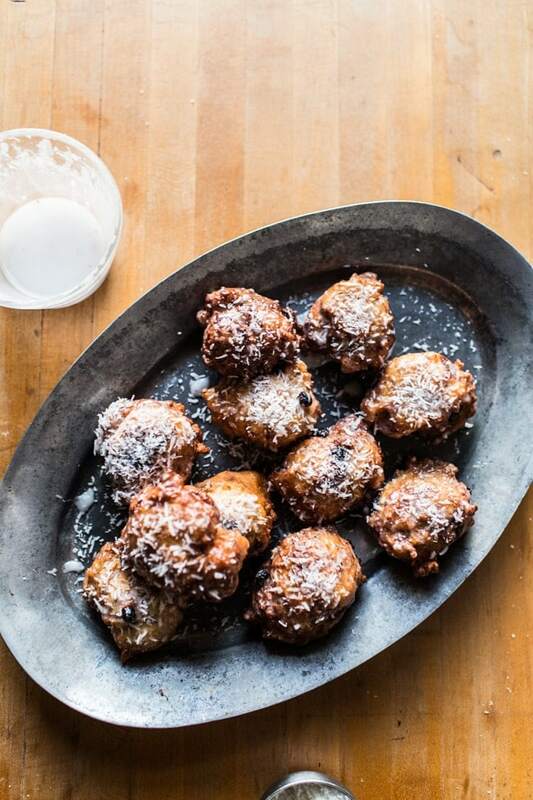 Even with all the recommendation lists of where to get ‘the best doughnuts in NYC’, I think I had them right then and there, stuffing 4 fritters at a time into my mouth. P.S. You may also notice a bunch of doughnut recipes up on blogs today becuase it’s #nationaldoughnutemojiday! Look out for the hastag on instagram for more fried deliciousness. In a large bowl combine the flour, coconut, sugar, baking powder and salt. Add the eggs and ricotta then stir until not-quite mixed with some floury patches remaining. 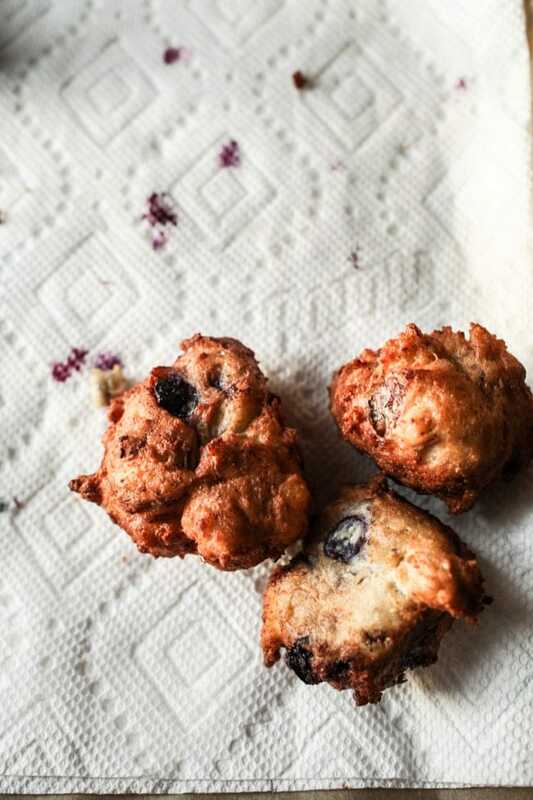 Sprinkle the frozen blueberries with some extra flour and stir to coat. 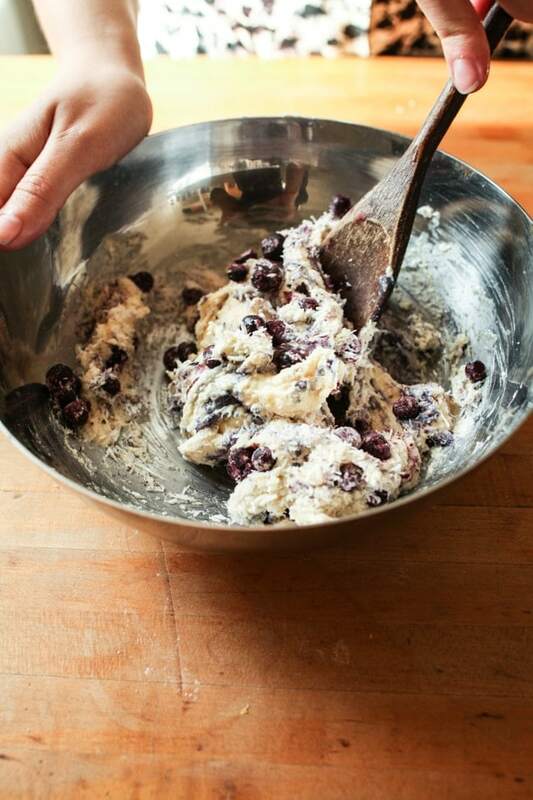 Add the flour-coated berries to the batter and stir in very gently until just mixed. Set aside for 15 minutes. Meanwhile heat a 2 inch depth of vegetable oil in a large saucepan to 365 F (185 C). 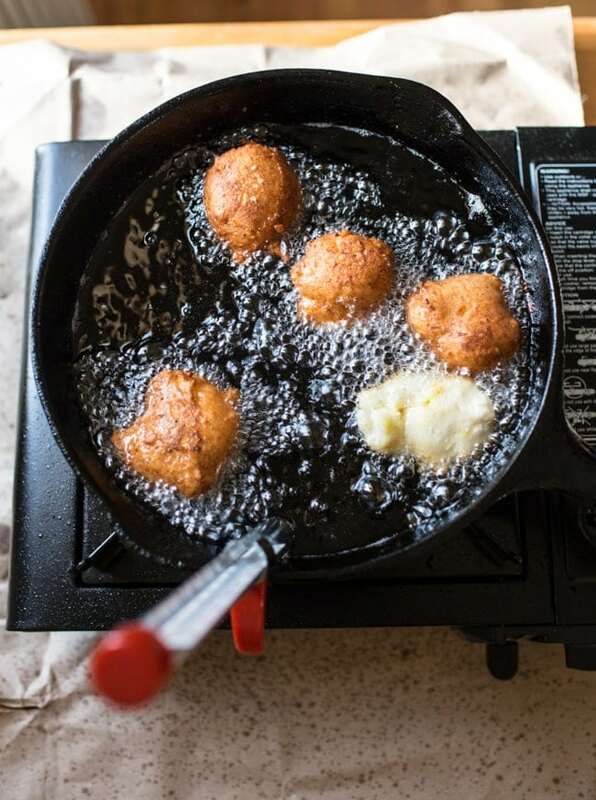 Using two oiled spoons, drop rounded tablespoons of batter into the oil. Fry until golden brown then flip and fry until the other side is golden brown (about 4 mins). Remove the doughnuts to a paper towel-lined plate to drain. Place the powdered sugar in a small bowl, pour in water 1 tsp at a time, stirring between additions until you have a pourable glaze. Dip the warm doughnuts into the glaze, turning to coat. Transfer to a piece of parchment paper and sprinkle with desiccated coconut then leave to set. These looks so good! I love the idea of adding ricotta! Ajklsdfghakslkfnf! These look beyond delicious. Blueberries! Lemon curd! Ricotta! Man, the options for these must be endless. Gotta love the world when there is an actual donut day. Your photos are so pretty…these donuts are calling to me! Such a perfect afternoon treat. 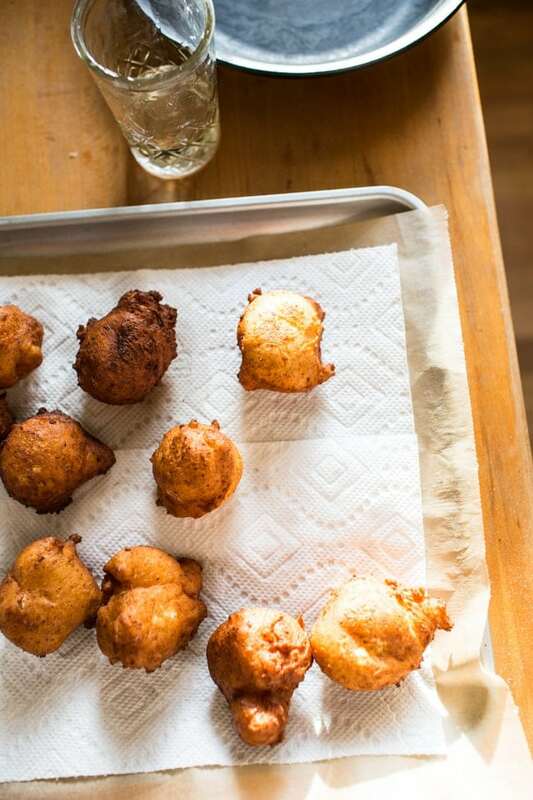 Only the ricotta doughnut can make the art of deep frying so lady like. I can not believe that those are frozen fruits! Very Clever. Izy, they have made me even more excited about doughnut day! Hey ! It’s National Doughnut day !!! and nothing …NO THING would come close to as delicious as these look in generic doughnut land ! 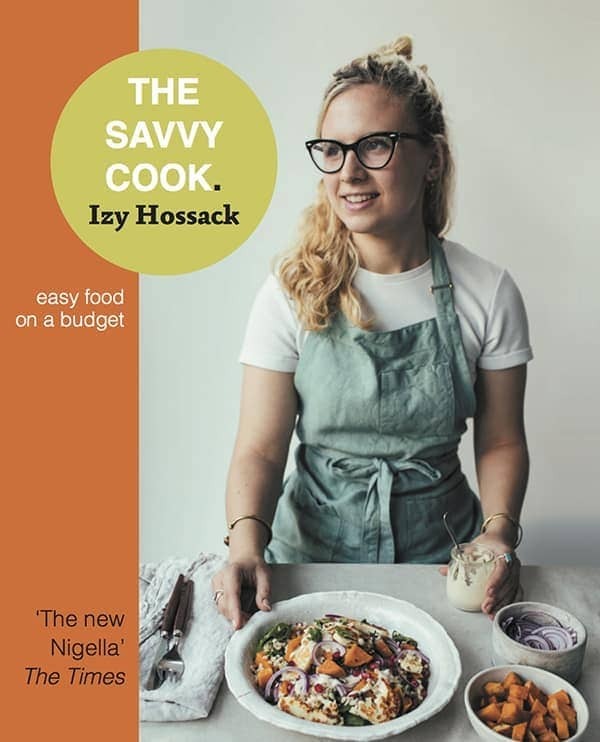 Thank God for you IZZY, we midwest American families are in love with your style and recipes. Phew. All it takes is an oven true to temp and some energy. I love cooking/baking with you ! These look so light and delicious – so easy to gobble up! I’m currently living with the pain of no oven – so hard to not make roast veg! Amazing! Happy National Doughnut Day!! These doughnuts look absolutely amazing, wild blueberries??? Yum! So exciting that you’re in the city! I’m a student at NYU and the food scene is unbeatable. I basically just cook and eat my way through… Any new restaurant recommendations? I’m also just beginning my journey as a food blogger, yours is so beautiful! Those sound absolutely amazing! Actually, so do your friends lemon filled ones. I will have to try making them as soon as it won’t heat my house to 1000° by turning the stove on. I’ve also heard a lot about the Trader Joe’s cookie butter but never tried it. Do you like it? Yum! I love wild blueberries. We used some to make 10-grain pancakes last weekend. This is a great new option to explore! I’m so all over these doughnuts! Could it get better? Highly doubtful! Yummmm! What a combination, it ssound sabsolutely wonderful!! 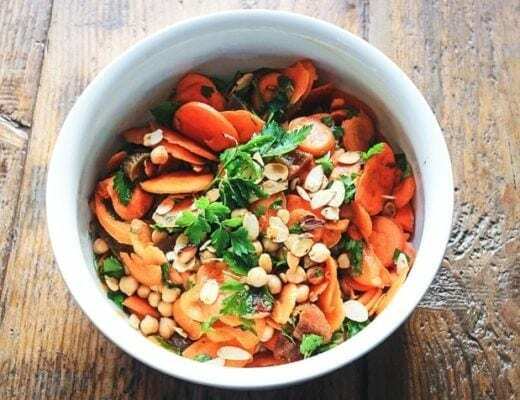 Your recipes and the photos made me more excited to know about your strategy to make such delicious recipes. 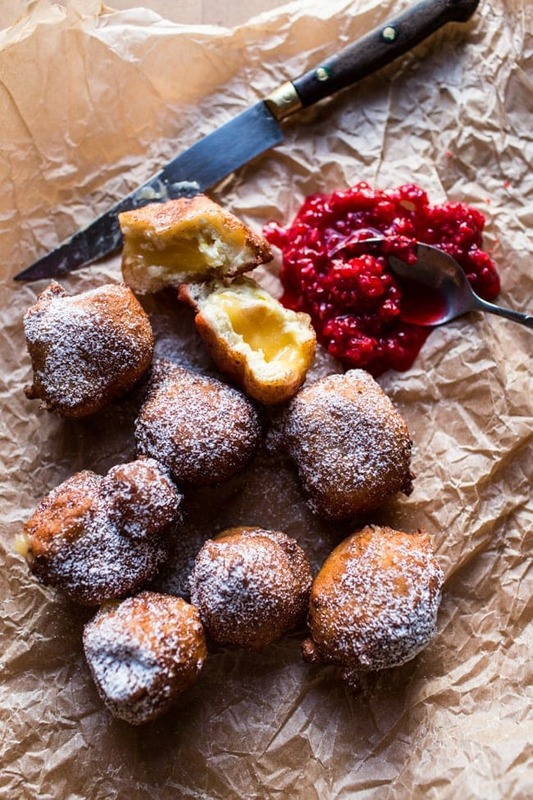 The photo of this recipes are so pretty and I like Coconut Ricotta Doughnuts sometimes.Thanks a lot. I used half mascarpone/half ricotta, and threw some raspberries in the mix. Tasted great. Thanks for the recipe! 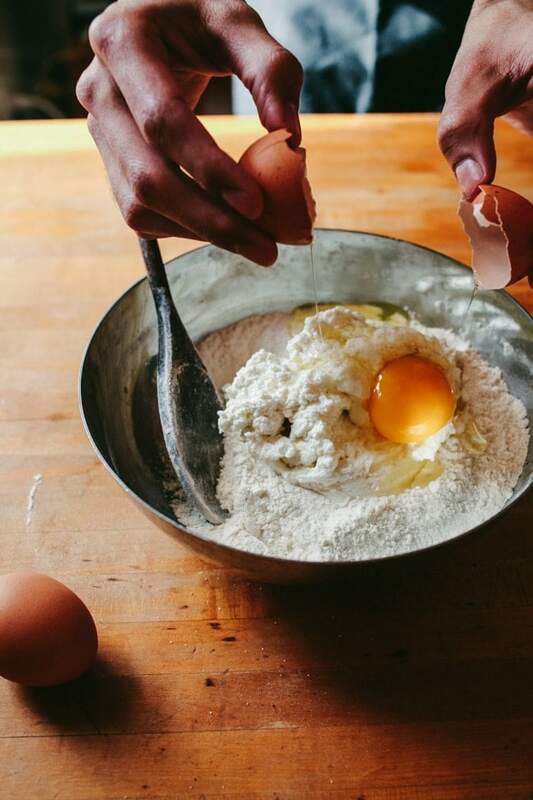 Hi Izy, do you think this recipe could work with another type of flour? Wholemeal or even spelt? I am French and when I was young, my family used to walk all day in the Alps to pick wild blueberries and I have kept fond memories of those adventures. Thanks for reminding me of those precious moments. These look divine! That is cheap chocolate; the next time I go to Trade Joe’s, I’ll have to buy a bar. Your photos make me so hungry. 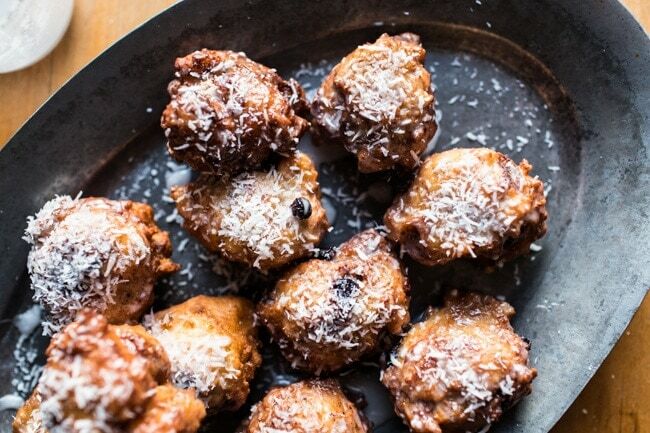 Adding ricotta is a great idea – and these do look so good! This brings back memories of making doughnuts with my roommates in college! It’s been awhile. I think I’ll have to start making them again with this being the first recipe I try! You can get something similar in Scotland called the Blaeberry. I think in England it’s called a Bilberry. They grow quite low to the ground in areas grazed by sheep and cows as they have munched the plants already. If they are left on their own they get quite bushy.